Josh Coclasure and Sammie Williams have been friends since childhood. They have always talked about starting a business together and finally had the chance to put their idea for bar and restaurant draft line cleaning services to the test in the Metro East Start-Up Challenge (MESC). In 2017, Coclasure and Williams won first place in the MESC for Pint Perfect and received start-up money from local sponsors, in-kind services, mentors and more. With that support and momentum, they have been moving along in starting their venture. The Illinois Small Business Development Center (SBDC) for the Metro East at Southern Illinois University Edwardsville (SIUE) introduced the competition in 2014. The Start-Up Challenge engages multiple sponsors and business professional mentors each year for entrepreneurs to assess how their business plans stacks up. Coclasure and Williams registered for a class through Micro Matic. It is an intensive draft line system class to become certified in the process, equipment and more. While the certification is not required, they want to improve individually and position their company as an industry leader. The certification will provide a competitive advantage over other businesses in the field. 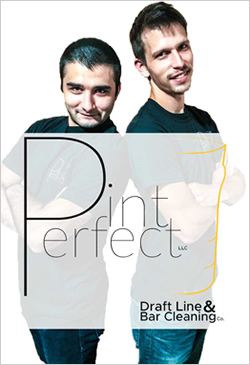 Pint Perfect keeps receiving positive feedback for their cleaning services or drink consultation ideas from bar owners and distributors. They are constantly growing their potential client list. Bar and restaurant owners, and beer distributors realize there is a need for this service. Routine draft line cleaning is often neglected, so it is convenient and beneficial for businesses to use Pint Perfect’s services. Most consumers do not know this service is needed in bars and restaurants. Pint Perfect also wants to educate the community that they should care about this issue. They can demonstrate dirty draft line pictures as proof. Lack of cleanliness in the lines affects beer taste and the quality. Owners sometimes forget about cleaning draft lines or do not clean them as efficiently as they should. That is one of the reasons Coclasure and Williams offer their services and expertise. They want to raise standards for everyone – consumers, business owners, distributors and manufacturers. Coclasure says, “Right now, we are putting hard work into growing what we will have.” Williams mentioned that the synergy between the two friends will benefit the business overall. While Williams has worked in the alcohol/bar industry for many years, Coclasure knows the structural side. Pint Perfect is expected to officially begin offering their services and expertise in the near future. Pint Perfect can be found on Facebook, Twitter and Instagram. For more information, visit pintperfectbeer.com. For more information on the Metro East Start-Up Challenge, visit siue.edu/metroeaststartup. The Illinois SBDC for the Metro East assists start-up ventures like Pint Perfect as well as existing businesses headquartered in the nine-county region of Calhoun, Jersey, Madison, Bond, Clinton, St. Clair, Washington, Monroe and Randolph. It is funded in part through a cooperative agreement with the U.S. Small Business Administration, Illinois Department of Commerce and Economic Opportunity, and SIUE as a service to Illinois small businesses. To learn more about the IL SBDC for the Metro East at SIUE, visit siue.edu/business/sbdc.